This boxing website dmboxing.com picked Giovanni “Gio” Cabrera Mioletti as one of 2018’s top prospects! On Friday, January 11, 2019 he showed us why! In a 10 round main event presented by Brian Halquist Productions, at the Emerald Queen Casino in Tacoma, Washington, Gio took out former world rated veteran Antonio Escalante in just 3 rounds. The undefeated Gio, fighting out of Chicago, Illinois tipped the scales 129.2 while Escalante, fighting out of El Paso, Texas, weighed in at 128.8, but that’s as close as the fight ever got! Before a packed house, Gio went to work from the opening bell. His movement and ring generalship clearly sent a message to Escalante, that this wasn’t going to be his night. In the second round Gio dropped the veteran with a crisp left hand on the button. Escalante got up and survived the round, but the writing was on the wall. In the third, southpaw Gio stepped on the gas and midway through the round used a right jab to set up a picture perfect combination, left uppercut followed by a right hook. Escalante staggered back and as he was about to hit the deck, Gio added another left hand for good measure. Escalante, again, managed to get up. However he was in no shape to continue and referee Bobby Howard decided it was time to say goodnight to Mr. Escalente. The time was 1:48 of the third round. The win upped Gio’s record to 15-0 w/ 6 KOs while Escalante falls to 29-10 w/20 KOs. 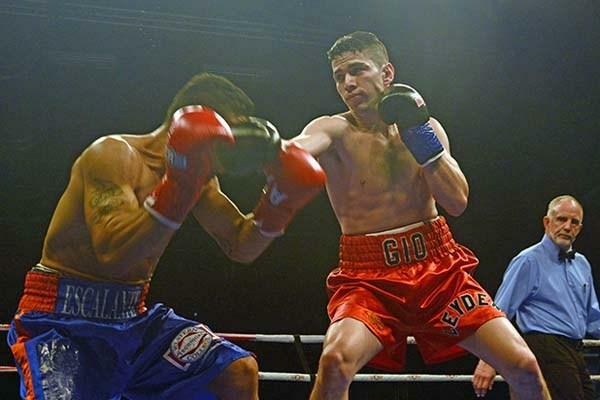 This website first published an article on Gio in June of 2018 and told readers “Keep an eye on this kid …” Since that article he has gone 3 – 0 with all three wins by knockout. Including a stoppage of previously undefeated Headley Scott (11-1). We hope you are watching. Look for the Gio Express to continue rolling on! On the following Monday he was back in the gym training and looking forward the next stop on his journey to a World Championship. 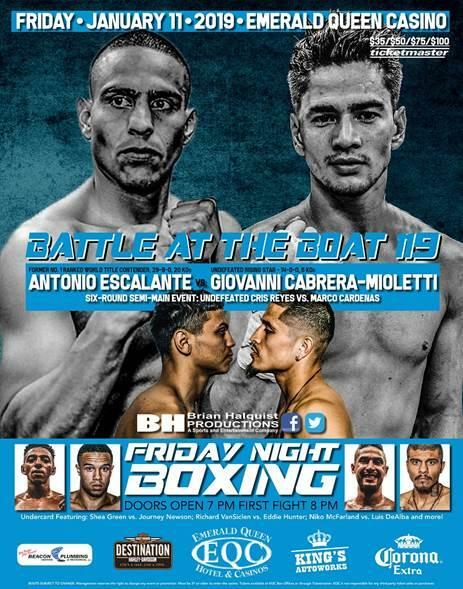 That next stop is scheduled for March 23rd back at the Emerald Queen Casino as Brian Halquist Productions presents Battle At The Boat 120. I remember when Escalante was a hot prosoect. Solid current prospect going now in Gio. That referee sure looks old!